The town of Barkan moves to honor revisionist leader Abba Achimeir, decades after changing name and offending family. The town of Barkan, a secular Jewish community in Samaria, has moved to honor Abba Achimeir, a Revisionist leader who was among the first to call for a Jewish uprising against the British occupation in the land of Israel. When Barkan was founded 30 years ago it had the name Beit Abba, in honor of Achimeir. However, some of the first residents believed the name to be old-fashioned, and changed it to the more “modern” Barkan. Their decision offended several of Achimeir's relatives, some of whom even avoided visiting the town for many years. 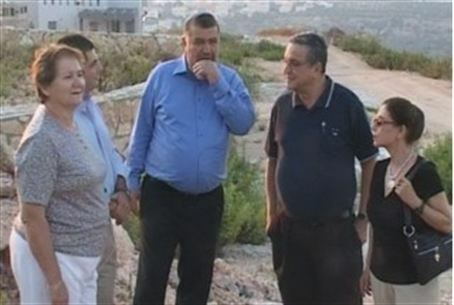 Six months ago Abba Achimeir's son, Yaakov, visited Barkan as part of an organized tour for media figures. During his visit he was touched to see a lookout point named in honor of his father. He began speaking to local resident Natalie Hershkovitz about the hard feelings caused by Barkan's name change decades earlier. Hershkovitz decided to do what she could to bring about a belated reconciliation, and to honor the man in whose name the town had been founded. Meetings with local authorities led to the decision to name a neighborhood after Achimeir, and to inform the Achimeir family of the decision. Yaakov Achimeir spoke at a dedication ceremony for the new neighborhood. He spoke of his father's dedication to Israel: “He called on the youth to go to jail in order to fight for the liberation of the land of Israel. He always spoke of Beit El and Hevron, the land of Israel was his essence. “If there is any man, although certainly not the only man, who is worthy of being remembered by a Jewish settlement in Samaria, it is my belated father, Abba Achimeir, who was a warrior who fought – not with a weapon but with a pen, with ideology – for the freedom of the nation of Israel in its land,” he said.